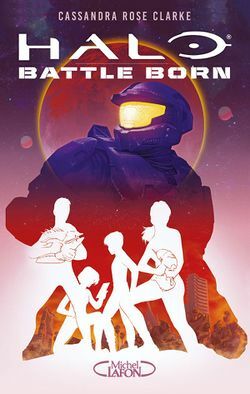 Halo : Battle Born est un roman de Cassandra Rose Clarke édité par Scholastic, et le premier livre de la série Battle Born. Il s'agit du premier roman Halo appartenant spécifiquement à la catégorie Young Adult Fiction. La traduction française, et en version numérique, est parue le 21 février 2019 chez Michel Lafon. L'auteure a décrit l'histoire du roman comme une version du film L'Aube rouge dans l'univers de Halo. La lutte pour la survie de l’humanité ne fait que commencer. Saskia, Dorian, Evie, and Victor aren't exactly friends at their small high school on the middle-of-nowhere colony world of Meridian. Each has their own problems, from absent parents to supporting their family, getting into a good college to making the next hit holo-film. But those problems were nothing next to the threat now facing their world: The alien alliance known as the Covenant is laying siege to Meridian, for reasons that aren't so easily explained. With their village in flames, the four teens find themselves stuck above ground, locked out of the town shelter where the rest of the survivors are gathered. Together, Saskia, Dorian, Evie, and Victor are thrust into battle with nothing but a few scavenged weapons and an injured Spartan, one of the UNSC's super-soldiers. What's forged from the destruction will determine the fate of Meridian, and tilt the battle for humanity's survival. Le site officiel de Michel Lafon ainsi que Amazon France ont annoncé la date de sortie au 14 février 2019 avant d'être repoussée au 21 février 2019 par Amazon.